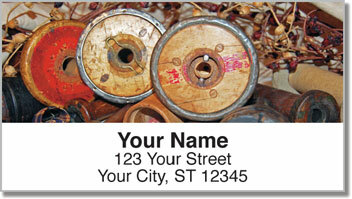 The empty spools photographed for this charming set of return address labels were the first chapter in a story. The thread on these spools was used in many different sewing projects - maybe to stitch together a cozy quilt, patch up a pair of jeans or quickly fix a young bride's wedding dress at the last minute. A needle and thread have saved the day more than once! Maybe that's why someone decided to keep these old spools as a little collection of memories. 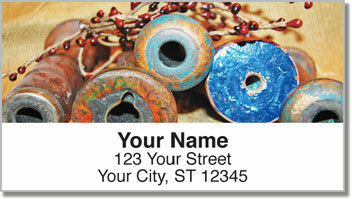 You'll love how your new mailing labels feature a convenient, self-adhesive backing. That means no more scribbling on envelopes. 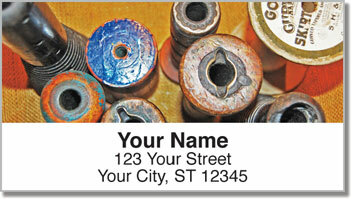 Simply stick them on anything you send out in the mail. 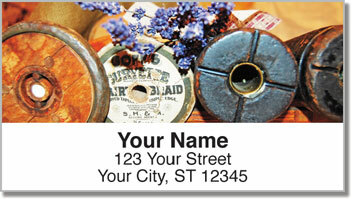 Order your very own Antique Spool Address Labels now! Get them with a set of matching checks!